Whatever stance one has taken on the credibility of TB Joshua, the famous (or infamous?) pastor of The Synagogue Church of All Nation's in Lagos, Nige ria – one fact remains indisputable, his is an incredible journey surrounded in mystery and being written in history. Joshua is easily the most vilified pastor in Africa, yet by far the most sought after. He is the hope of multitudes and yet the headache of religious bodies, who have vehemently disowned him but can't seem to ignore him. It is a living drama being watched world over, as time's steady course continues its revealing discourse on truth and authenticity. But what is it about TB Joshua that has actually engendered such outright denunciation and renunciation by his fellow labourers in the vineyard? 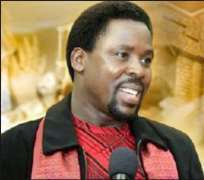 Upon perusal of the apparent grouses and grudges of the Pentecostal Leaders of Nigeria against the enigma and personality of Prophet TB Joshua, high up on the list is the issue of his mentorship. “Where was he when he was called to ministry? Who are the men of God who can point at him, that we raised him into ministry, laid hands on him and sent him forth into the ministry?” says Paul Adefarasin, the charismatic founder of House of the Rock, Lagos. “We don't know Joshua's Pastor; we don't know where he was raised from. He has no testimony from where he got born again. So, we cannot accept that he is one of us… There is no proof of his salvation,” explains Matthew Ashimolowo, the prosperity preacher and founder of KICC in London. “There are only two questions Ayo Oritsejafor (President of the Pentecostal Fellowship of Nigeria) asked us to ask Joshua or anybody who comes from him: When were you born again? Which church did he attend and who was his pastor or mentor?” fumes Bishop Abraham Olaleye, a vice chairman of PFN. “Who were his contemporaries when he gave his life to Christ? What led to his confession of Christ? How did it happen? Where was he baptised? Who baptised him? Who are his pastors? Where did he train? Who is the Paul of his Timothy?” asks Bola Akin-John, a Pentecostal church growth expert. That miracles and commendable charitable works are happening in his church is attested to by almost all, but such leaders can't seem to fathom how a man so mightily gifted could have attained such a level without human tutorship and training. As such cannot be explained by the logic and lectures of theological training, they readily write him off as demonic and diabolic. Surely, a man of God of such stature and status could not just spring up without the approval and appraisal of some top-notch Christian leaders? Thus, they have proclaimed to all willing to listen that anyone who associates with TB Joshua does so to their own folly, be him a president or pauper, simply because they have adopted a strong position without investigating its foundational validity. However, the phenomenon of men being used by the Almighty without human tutelage is not isolated to the instance of Pastor TB Joshua. Thorough biblical exploration would reveal many of God's generals with no record or register of human mentorship. Who was the mentor of Jeremiah, who the Bible says God called right from his mother's womb? Who was the mentor of John the Baptist, sent from above to prepare the way for the Saviour? Who was the mentor of Apostle Paul, who was blinded on the road to Damascus while intent on the destruction of Christians, subsequently to become a leading figure in New Testament Christianity? What about Moses, Elijah or King David? Human backing and tuition are clearly not a qualification for divine assignments. What then is the premise for church leaders today to demand proof of mentorship as a seal of apostleship? Can this assertion be attributed to the application of biblical principles, or to personal misgivings and prejudice? Why has the Nigerian Pentecostal church chosen to adopt a stance on a particular person that contradicts and conflicts with scriptural authority and experience? It appears to be a case of addressing private qualms and jealousies under the guise of Christian comradeship and censorship, misguiding and incensing millions of followers against TB Joshua and projecting the image of a warring and divided church in the process. Yet, T.B. Joshua's own website recounts the extraordinary tale of his calling into the ministry, available for all to read and dissect: “I was in a trance for three consecutive days, then I saw a hand that pointed a Bible to my heart and the Bible entered my heart and my former heart seemed to immerse with the Bible immediately… I heard a voice saying, “I am your God; I am giving you a divine commission to go and carry out the work of the Heavenly Father… I would show you the wonderful ways I would reveal myself through you, in teaching, preaching, miracles, signs and wonders for the salvation of souls”. So, is it a crime for God to call one for His service without consulting certain people or meeting certain manmade criteria? Are we mere mortals in a position to query God's wisdom and ways? Chiji Okafor, the celebrated Nigerian columnist and artist, wrote of such a disposition and demeanour: “It is amazing that anybody who lays claim to being a pastor of God should be talking about mentoring in matters of the faith as if talking about some rookie artisan being shepherded into 'freedom' from his master's workshop. Such drivel simply speaks volumes of the man who utters it. It reveals the depth of vulgarity to which our 'modern' men of God have allowed the gospel of Jesus Christ to sink. “Anybody who boasts in God's vineyard about his mentor and such other inane subjects as earthly endowments has simply not imbibed the lessons of Christ's personal life. Jesus Christ the Son of God could have been born a prince, if He so chose. On the contrary, God made man, decided to come into this world, the son of a wretched carpenter born in, of all places, a manger and side-by-side animals! He had neither an earthly mentor, nor did the Bible tell us that He had doctorate degrees in sacred theology and dogmatic philosophy. Clearly, the question our revered gentlemen should ask is not, 'Who is your mentor?' but 'By what authority are you acting?' in conjunction with the biblical standard: 'By their fruits, you shall know them.' The attributes and qualities a person possesses speak volumes of their source of strength. The steadfast consistency, prophetic insight, charitable disposition, healing gifting, practical teaching, heavenly wisdom and childlike simplicity of T.B. Joshua cannot possibly be the product of illusion, sorcery or man's acumen. The testimony of Ghana's new head, Prof. Atta Mills, alone is enough to confirm the genuineness and greatness of Joshua's ministry and calling. Has history ever heard of a sitting president visit a church and publically testify that the pastor accurately predicted the outcome and specific details of the election to him? His testimony echoes the tens of thousands who rush to Joshua's church on a weekly basis to receive a touch from God.